soap:ServerServer was unable to process request. —> A Web Part or Web Form Control on this Web Part Page cannot be displayed or imported because it is not registered as safe on this site. You may not be able to open this page in an HTML editor that is compatible with Microsoft Windows SharePoint Services, such as Microsoft Office SharePoint Designer. To fix this page, contact the site administrator to have the Web Part or Web Form Control configured as safe. 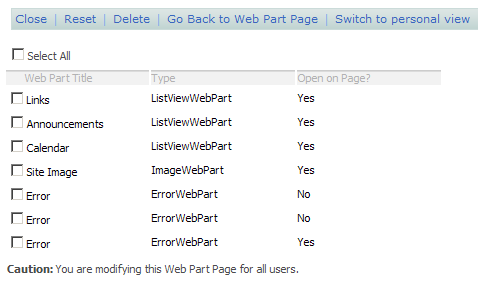 You can also remove the Web Part or Web Form Control from the page by using the Web Parts Maintenance Page. If you have the necessary permissions, you can use this page to disable Web Parts temporarily or remove personal settings. For more information, contact your site administrator. I did a little browsing is it turns out the problem was with a web part that had error-ed out. When the error occurred I closed the web part, never to be seen again. Closing the web part is what led to this problem. 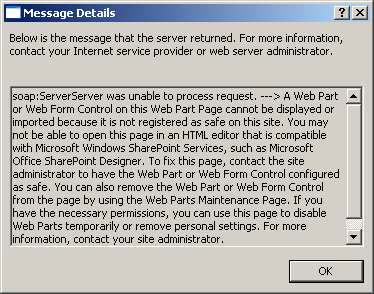 Notice in SharePoint you close web parts – meaning that they are technically still on the page, just in a closed state. What I wanted to do is “delete” the web part instance from the page. This will put the page into the Maintenance mode mentioned in the error. From this page you can completely remove web parts from their pages. Its a good idea to check this every once and a while, because closed, unused web parts can still consume resources and slow down page loads. really useful, thanks thanks thanks! but i dont know how did you know this trick! Really useful, thanks a lot ! Thanks! This saved a lot of headache. I knew something like this existed, just didn’t know HOW to access it! THANK YOU! I have been looking and looking for this solution. I really appreciate your expertise.